Topic: "The Wonderful World of Publishing"
His talk will detail the travails of becoming a published author. With the election two days before, he is hoping for a light-hearted presentation. His books are "A Rose Blooms in Texas--Coming of Age in the Civil War Era" (available on Amazon with about 7 reviews--5 Star!) The other is a brand new children's book, "Wrangler George and Buzz" which, is just released and is making its debut at the Kinkaid School Book Fair on Mon, 11/7. He will bring some books but as the copyright is owned by a non-profit corporation, he is not able to "sell" books but will give one to anyone making a donation--cash, check or credit card--to the Hamilton Educational Foundation, which will then send a check to the Kiwanis Foundation for the Eliminate (tetanus prevention) Project. Dr. Hamilton is Special Advisor to the President of The University of Texas Health Science Center at Houston and Professor of Intemal Medicine at the UT Houston Medical School. He has practiced clinical endocrinology and intemal medicine with The University since 2000 and was previously a partner at the Medical Clinic of Houston. After graduating from Baylor College of Medicine, he completed his Intemship and Residency at The Johns Hopkins Hospital, an endocrine fellowship at the Massachusetts General Hospital, and was Chief Resident in Medicine at Hopkins. He was on the full-time faculty at Hopkins before serving two years as an endocrinologist at the Wilford Hall USAF Medical Center in San Antonio, Texas. He was in private practice for 26 years and a Clinical Professor of Medicine at Baylor College of Medicine before assuming his present position in 2000. 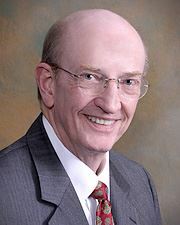 He has been active in medical organizations serving as President of the Texas Society of Intemal Medicine, Houston Academy of Medicine and Harris County Medical Society. He has served as a Trustee of the American Society of Intemal Medicine, member of the American College of Physicians Health and Public Policy Committee and the American Medical Association Federation Advisory Committee. He was a member of the Practicing Physicians Advisory Council to the US Secretary of Health and Human Services for issues related to the Center of Medicare and Medicaid Services and served on the Health, Medicine and Research Committee of the World Anti-Doping Agency which oversees the intemational prohibitions of the use of hormones and performance enhancing substances in athletic competition. He served as the President of the American Association of Clinical Endocrinologists and the American College of Endocrinology.